I was surveying the street residents post a crime incidence when I met Shivani Sharma. Shivani is a home maker in a poor, destitute family living in 542 Sector 9 Faridabad. Their hindu pandit family had come in as refugees from Afghanistan a few years back and had been granted Indian citizenship. However, they had lost everything in transition but a basic human decency and pride. And were a family of 8 staying in a one room set as caretakers, while one male member was running a tea stall as their sole source of income in a nearby hospital facility. When I went for the survey to Shivani Sharma’s place on 30th Dec14, she took courage and reached out in desperation. ‘There was some property that they could put up as security…they required 1 lakh desperately’. I was appalled. One lakh was a huge amount – I had already loaned a substantial amount to my driver, family’s medical demands and commit for the lane security were all accumulating into a tidy sum. I asked for the medical papers for review as I left for office work. On 30th evening, I went back and collected the medical papers and got some more details. Since I was leaving on tour on 31st morning, I scanned the image and sent it to an eye doctor in the acquaintance circle. She was also on leave, travelling to Pune to be with her family. However, over the next two days, while on tour, I got her input. The eye operation was required – it could cost a little lower at about 80 k ina good facility but that was it.. I came back from tour on 5th and was in Faridabad till 9th. I quickly tried to reach out to people to understand options, raise funds and explore costs. Dr Bharti Gupta , a known Fbd eye surgeon, was travelling on year-start holiday, would be back on 13th as per his office. Some like-minded persons committed a limited opening support. An ex-lion club member declined support saying this was no longer a focus! A warm response came from Protima Garg/Sec 9 who pointed out to Rotarian Mr Vasudev (15th Jan), who committed +ve support but wanted to meet the patient. I arranged this on 16th. Mr Vasudev then pointed out to Mr Pattwa, head of a NGO doing eye operations at Santon Ka Darbar,NIT Faridabad and which was supported by the Rotarians. I talked to Mr Pattwa – he pointed out that they only did cataract operations and for Retina we had to go elsewhere. He pointed us to Dr Shroff Charitable eye hospital in Daryaganj, Delhi. I took inputs from others in my circle. The private practice in Dr Shroff apparently charged a lakh+ for similar operation. At any rate, my other eye doctor contact said that they had good facilities and were worth exploring and so, 17th Jan, I took an appointment and took Vicky with his 2 family members to Dr Shroff’s at Daryaganj. 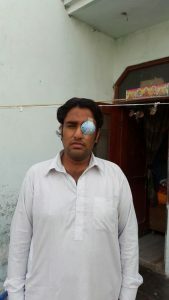 If we did not get the operations done immediately, he would lose vision in both eyes over a short period of time. 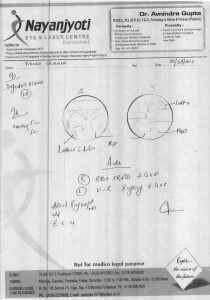 Against my fears of 1lakh eye surgery cost per eye, the counsellor took into account the poor family and gave an estimate of 41k+9k which was further reduced to 31k+8k. Then I interacted with Mr Hari Gupta, the patient, benevolent administrator at Dr Shroff . He heard me as a good Samaritan helping out a poor person in desperation. He asked me to send the family to him independently which they did after their tests. Then he talked to me on the phone. ‘ We are reducing the main operation charges down to 10,000/- per eye and minor operation to ~5000/- per eye as a special case’ was like God sent support to us, as I was mentally committed to help Vicky thru. Now – the revised budget was 30000/- for both eyes and approx. 10k for misc expenses, logistics etc. – total Rs.40,000/-. This was further rendered manageable as the hospital would have to operate first on the left eye and then later on the 2nd eye –so the payment requirements were staggered. The first operation is to be on 29th Jan (rescheduled to 6th Feb)– the hospital specially gave this date to ensure we did not lose time . Of course, no one can guarantee a perfect recovery – that is in God’s hands. However, they are clear that if we do not get the operation, Vicky will lose both the eyes. At this stage, we are looking at sponsors to raise the 40k for Vicky’s eyes – if required, in two batches of 20 k each across 30+30 day period. Vicky was operated across 6 months. First he had to be treated for his persisting fever – then the operations (4 surgeries) proceeded. Final costs were a little above Rs.50,000/- ( the post-operative, logistics and misc support to the family were approx. 20,000/-). Yes- Vicky’s eyesight was saved. He now works as an independent job earner for the family.